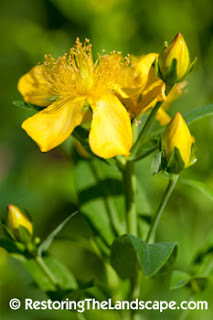 I was going to feature this St. John's Wort for the Native Plant of the Week, but realized I had already featured it in an earlier post. 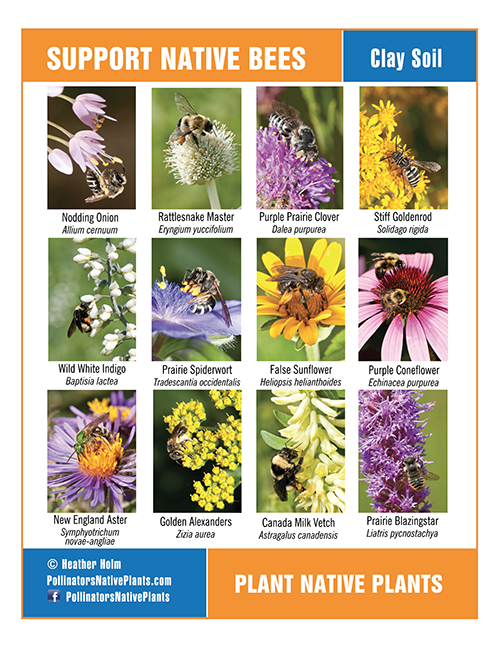 Since that post, I have photographed many more pollinators on this native perennial. 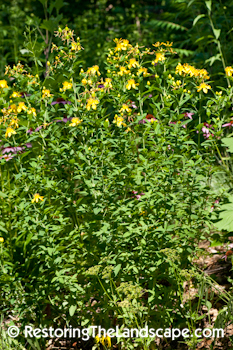 Great St. John's Wort's native habitat includes mesic to wet areas, along the edges of wetlands and lakes. It tolerates full sun locations but prefers partially shaded locations. 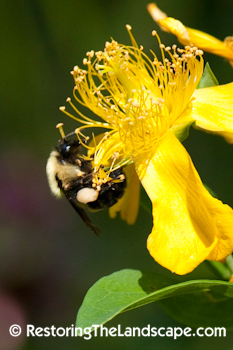 Great St. John's Wort is a tall, upright bushy native. Visitors to our yard often ask if it's a shrub because of its large stature. It can reach heights of five feet in moist, rich soils, in our mesic yard, it grows to about three feet in height. 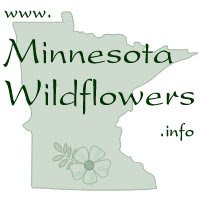 Pollinators love the large, open flowers with the numerous stamens. Leafcutter Bees in the Megachile genus are common visitors. Their abdomens turn bright yellow as the pollen collects on their abdominal hairs. 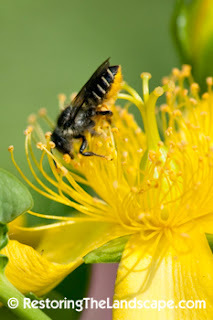 Leafcutter Bees also like the large leaves of Great St. John's Wort and have been cutting and collecting pieces of them for their nesting materials. Bumble Bees also like the flowers. 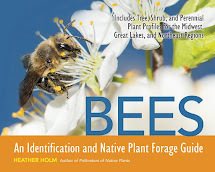 Bombus griseocollis and Bombus bimaculatus are common Bumble Bee species that are visiting the flowers in our yard. These Long Horned Beetles (Typocerus velutinus) have been abundant in the yard this year. 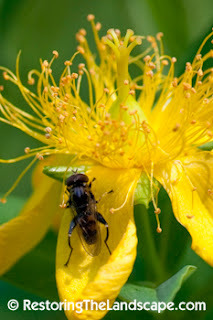 Several of these beetles can be found on one Great St. John's Wort plant feeding on pollen. Flies are attracted to the flowers too. 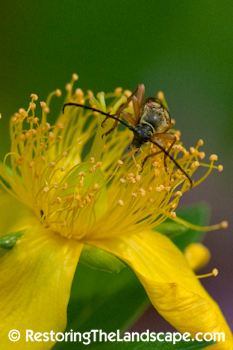 I don't have any information on whether this Hypericum produces nectar or not, my best guess is that it does not. 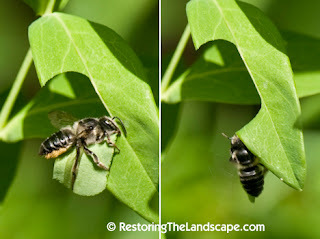 The Syrphid flies like the one pictured here are probably consuming bits of pollen that have dropped onto the petals. 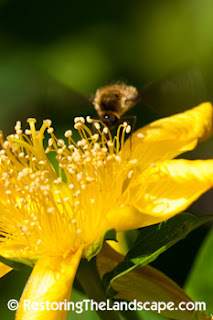 Greater Bee Flies (Bombylius major) seek nectar on the Great St. John's Wort, hovering above the flowers like hummingbirds and probe flowers with their long tubular mouthpart. These are just a few examples of the many types of pollinators that visit Great St. John's Wort flowers. If you have a medium to moist location, this native perennial will brighten any partially shaded location with its extremely showy flowers.